As most people know, the midwest is experiencing bone-chilling, record-shattering temperatures due to wind chill. Certain places in Iowa are expected to drop down as low as -60. That’s absolutely absurd; any exposed skin will get frostbite in a matter of a few minutes. 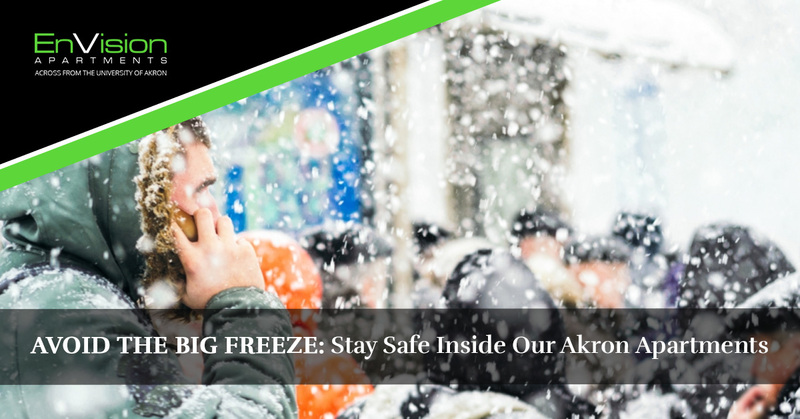 We’ve seen some pretty cold days here in Akron, but a wind chill factor like this doesn’t come around too often. We’re grateful for that fact. Baby, It’s Cold Outside…Really, Really Cold. But now, we have to deal with this crazy winter storm. For most University of Akron students and Akron residents alike, that means completely skipping out on going outside of their student apartment. Here at the EnVision apartments, we completely respect that decision because it’s the safest thing to do. The cold can’t affect you if you’re all warm and cozy inside of our apartments in Akron, right? Unfortunately, no matter the conditions outside, some people still have to meet their obligations: go to work, visit a friend, or do whatever they feel called to do. We’d hope that plans like these could wait a few days until these ultra-frosty winds die down over the weekend, but we also know that some brave souls will still bundle up and head into the wind. The good news is that campus is officially closed this Wednesday, January 30th, as per this official tweet from campus officials. We’d trust that you’re aware of this news, but if not, please, don’t bother attending a class that isn’t in session! We’re talking about more than putting on thermal base layers, an insulated down jacket, and a waterproof shell. We’re talking about covering up your face with multiple face masks/buffs, covering your eyes with goggles, and covering your head with multiple hats underneath multiple hoods. We’re talking about we’re long johns, leg warmers, and thick, insulated boots. If you’re planning on going outside in this (which, again, to be clear, we absolutely do not recommend), then you better plan on looking like the Michelin tire man. As a UA student, you should already have free access to Akron’s public transportation system. But even without a free student pass, the bus system is being offered for free due to these insane temperatures and wind speeds. There’s no reason you have to walk anywhere, even if it is a short walk from our Akron apartments. Bless these bus drivers during this perilous time. Doesn’t the warmth and shelter of a pillow fort inside of your insulated shelter feel nice and cozy? It should, and it certainly beats going outside in this. Do it; you won’t regret it! Our goal is to keep our students sheltered, warm, and comfortable during this freak storm. If you have any questions at all, please do not hesitate to get in touch with us. Pass The Time By Scoping Out The Rest Of Our Blog!